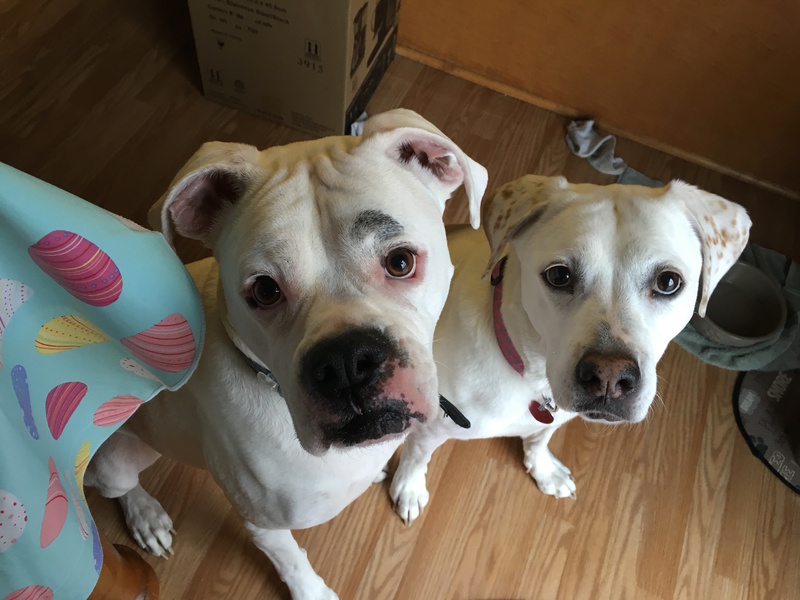 Porter (left) is a six-year-old Boxer who welcomed Sammie (right) a two-year-old Lab Springer mix into his home. Since Sammi’s arrival, Porter is barking more and nudging his guardians for attention. The guardians also wanted me to help with a few of Sammie’s issues; getting over excited, mouthing, nipping, jumping up, playing too rough with Porter and aggressiveness to the neighbor’s dog who is yappy. Their guardian had told me that Porter was pretty much letting Sammie do whatever she wanted and Sammie was taking full advantage; chewing on Porter, nipping at him, stealing his toys and trying to assume the top dog role. When we were setting up the appointment, the dog’s guardian mentioned that they’s noticed Porter getting a little bit more aggressive since Sammie’s arrival. She also mentioned that the dogs had gotten into a few fights over food. This is usually the case in houses where the dogs don’t have enough structure and discipline. When I arrived for the session, the dogs were in a very excited state and Sammie did go after Porter a little bit in a case of redirected aggression. When you bring a new dog into a home with an existing dog or dogs, it’s natural for the new dog to try to push the boundaries. This is the dog’s way of attempting to figure out where they fit into the new pack dynamic. If the dog doesn’t receive pushback from the other dogs or the humans, they will assume that they can move forward and take up more of an authoritative position, in their own mind. When I sat down with the guardians to discuss the situation, I could see this clearly was the case. Both dogs invaded the human’s personal space, especially when it noticed the other dog was receiving attention. To help humans start adding structure to their distribution of affection and attention, I went over a technique that I like to call Petting with a purpose. Next I suggested that the guardians introduce a few new boundaries and rules and enforce them immediately when the dogs cross the line. Many people assume that it is mean to correct a dog. In fact correcting the dog with good timing is one of the primary ways that humans communicate with dogs. Something interesting happened as we were starting to apply the new rules and structure. The dog that the guardians had identified as the one being more assertive or dominant, Sammie, regressed into a very passive or submissive role. I have seen this phenomena happen multiple times where one dog thinks that it is in charge until one of the humans takes control. When this happens it’s a little bit unsettling for the dog. They are a little bit bewildered as to where their new place is so they tend to gravitate towards a very submissive state. As the guardians assume more of the leadership role and Sammie gets used to it, she should start showing more confidence again. This is the target goal. We don’t want to dog to be too submissive, or too dominant. As I watched the guardians interact with their dogs, I identified a few situations where they were conveying their message in a way that was confusing to the dog. Specifically, they were late in applying their attention or affection. One of the ways that dogs learn is through association. Let’s say that you establish a boundary that the dog is not supposed to cross. If you consistently disagree with the dog the second that it crosses the threshold, the dog will eventually understand that you disagree with crossing the threshold and remain on the other side without needing a correction. But if you’re not paying attention, and the dog is able to cross the threshold without any rebuff or reprisal, eventually when you do correct them they have no idea why you were correcting them. This lack of consistency is confusing for the dog and a pretty common mistake made by dog guardians. For this reason I suggested that the guardians immediately correct either dog anytime they start to break the rules. If they’re consistent with good timing, eventually the dogs will understand what the humans want from them and to start respecting the rule on their own. I went through a couple of different ways to reward the dogs as well as how to correct them when the dogs didn’t get the message the first time. After establishing this new structure and discipline I wanted to repeat the door answering ritual and show the guardians how they could use what they’ve learned to get the dogs to stay away from the door. Because of the open layout of the homes floor plan, I had arranged the chairs to create a bit of a corridor leading from the door to the boundary. It’s always advisable to alter your environment when necessary to achieve the results you’re looking for. It took a couple of minutes, but eventually the guardian was able to keep the dogs behind the boundary a good 20 feet away from the door without any physical barrier between them. I suggested that the members the family call and text each other when they are on their way home so that they can practice claiming the doorway this way. Practicing it with members of the family allows us to avoid the additional baggage that comes with having a guest hear dogs barking behind the door for several minutes. It should only take 6 to 12 practice repetitions before the dogs start keeping their distance from the door on their own. By the end of the session, Porter had adopted a calmer energy and Sammie’s confidence was starting to return – although she was no longer trying to assume the dominant role. Both dogs will have their ups and downs as the guardians establish this new rule and leadership structure. But by consistently applying corrections and rewards with good timing, the dogs will identify the humans as being in the leadership position. Once they accept that the top dog spot is no longer available, they will be content in the follower position and stop pushing or breaking the rules.